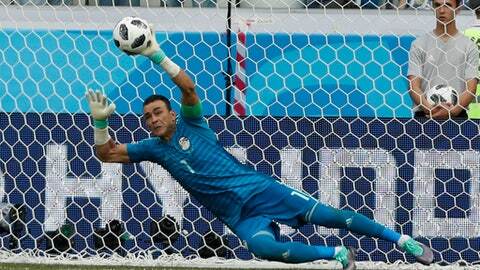 VOLGOGRAD, Russia (AP) The oldest person to play in a World Cup match made some spectacular saves Monday. He also watched two go past him. Egypt goalkeeper Essam El Hadary, who is 45, took the field for his team’s final group match to set the record. Although he saved one penalty, he couldn’t stop Saudi Arabia from winning 2-1 in a game between two teams that had already been eliminated. Salem Aldawsari scored the winner for the Saudis with almost the last kick of the match, volleying past El Hadary from a tight angle inside the Egypt penalty area. Mohamed Salah, playing for the second time since injuring his left shoulder in last month’s Champions League final, had put Egypt ahead in the 22nd minute after deftly controlling a long ball from Abdalla Said and then lobbing goalkeeper Yasser Almosailem. It was Salah’s second goal at the World Cup, and Egypt’s first in open play at the World Cup since 1934. Salman Alfaraj got the Saudis level with a penalty kick in first-half stoppage time after Ali Gabr brought down Fahad Almuwallad in the area. The decision was confirmed after a video review and the penalty was taken in the sixth minute of injury time. Almuwallad had earlier missed a chance to equalize when El Hadary saved his penalty. The veteran goalkeeper dived to his right and flicked his left hand up to push the shot onto the bar before it was cleared. El Hadary was unable to repeat the feat at the end of the half, going the wrong way and having no chance as Alfaraj scored from the spot. El Hadary also made a series of good saves in the second half to deny Saudi Arabia, notably in the 69th minute when he tipped a header from Hussain Almoqahwi over the bar. A minute later, he parried away a goal-bound header from Muhannad Asiri. He had no chance with Aldawsari’s last-gasp winner, however. El Hadary overtook Faryd Mondragon as the oldest person to play at the World Cup. The Colombia goalkeeper was 43 when he came on as a late substitute in his team’s 4-1 victory over Japan four years ago at the World Cup in Brazil. Saudi Arabia finished third in Group A with three points while Egypt was last. In the other group match, Uruguay beat Russia 3-0 to finish first to clinch the group. Following the later matches in Group B, Uruguay will play Portugal in Sochi on Saturday in the round of 16 while host Russia will face 2010 champions Spain at the Luzhniki Stadium in Moscow on Sunday. After weathering Egypt’s dominance in the early stages of the first half, Saudi Arabia visibly grew in confidence, keeping possession for long stretches. Egypt was hurt when midfielder Abdalla Said went off with an injury at halftime.